hmmm... is this the great Desert driver ??? mister T - is that you ? 3idha i dont know about the k24 - but thats a good idea! - But would the engine actually fit? What i would actually do is go for a K20a3 engine (Type R is K20a or K20a2). This engine is found in the Honda Stream and gives out a good 170Hp and around 133 trq. (not bad compared to a stock civic). I guess if u can fit a K24 it would be really good - not only do u get Hp but alot more trq as well. Anyone know about swaping a K series engine into a 7th gen civic ? - what are the complications? costs? - would really be interested! And I don't know, but the K20 (200hp), or K24 (170?hp) .. They are more torquey though.. and pretty decent engines. But as I said, i think the k24 is heavier than the k20. wooow i got sum good replys..
3rd thing wtf your talkin about all these things like Camshaft/Underdrive Pulleys/ Port & Polished Throttle Body/ Knife Edge Butterfly/ Cam Gears/ ECU Tuning, but these things arent avialable in the market at all! !atleast not in qatar...if they are in dubia pls do let me no so i can get dem....however,i dont see the reason to put all these things in my engine when its not even a vtec. Plus iv heard ppl do convert there engines into a vtec but its not easy. Do you have more info on changing my engine in2 a vtec...???? The best engine would be k20 as everyone said. k24 from accord(like i have) is good and powerfull engine (189 hp) but its going to be way too heavy for ur cars front. I have got a question for ya?Why do u wana change ur engine?Its new man.As i understand ur civic is 2005.Think before u wana do the swap.If it was below 2000 then sure go ahead. If u cant afford to have two cars go for the vtec conversion of ur engine.Research for parts and where u can do it. Or better of sell ur car and get 2002 TYPE_R, my friend (Stas) got his a year back for 50k. 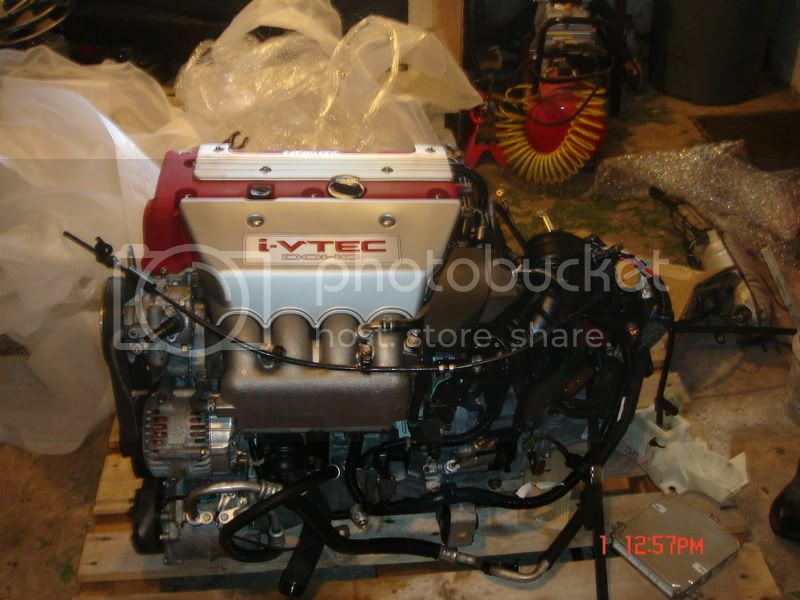 Im myself changing my k24 for j30 now to get more power and then go crazy with the bigger engine. grayfox666 wrote: The best engine would be k20 as everyone said. for a while i have been thinking about a new car but i cant go 4 it now..soo thats why i wanted 2 fix up my honda....any1 else got any idea's?? ?....any1 got info on the vtec conversion? !....and plus my engine's mileage is 2 much...its goin 165,000km+ ...soooo i mean working on dis engine wont b any good...lookin 4 da k20a...hook me up wid info guys? Sorry ,ny bad.I thought that ur car is 2005. 163k is much then ofcourse change the engine. if ur lucky enough to purchase the K20 in Al Taif .. then it would be better if ur gonna let experienced people and garage who gonna do the swapping ..